Azerbaijan is modernizing and strengthening its industrial potential, Azerbaijani President Ilham Aliyev said. 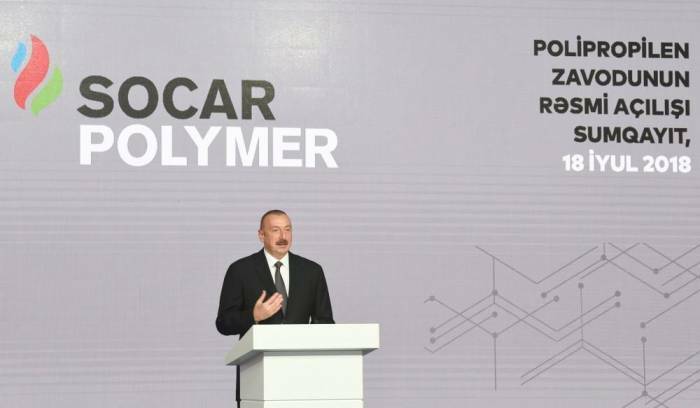 He made the remarks July 18 at the opening of a polypropylene plant built within the SOCAR Polymer project in Sumgait Chemical Industrial Park in Azerbaijan. The Azerbaijani president said that the export potential of Azerbaijan will increase significantly as a result of commissioning the polypropylene plant and a polyethylene plant at the end of the year. Azerbaijani President Ilham Aliyev also touched on the opportunities for the work of Italian companies offered in Azerbaijan.